I just attended the Eumetsat Meteo Satellite Conference in Cordoba, Spain at a beautiful location right by the Mezquita. 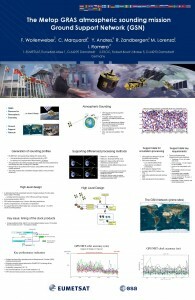 The event brings together many satellite Meteo researchers. As you know most Meteorological satellites carry on-board many different scientific instruments, and this conference brings together a very heterogeneous group of scientific people which as very informative and useful to put our GNSS engineering work into context. I was sent to the conference to present the GSN poster. The GSN is a support service that i have been a part of since 2003 through initial study, conceptual design, implementation, launch, improvements and maintenance. It provides Eumetsat with support GPS products on a very strict time basis to process the Metop satellite GRAS radio occultation instrument. The poster can be seen below, Enjoy! It was a fun short trip and I am glad to be able to represent the GSN project in this international conference.